Bistro 4201924 278123/275325work RestaurantBistro 42 is a restaurant and bar with modern interior and a cosmpolitan menu. Bistro 42 offers a unique eating and drinking establishment to the people of Horbury, Ossett and the surrounding areas and quickly became known as ‘the place to be’ for young and old alike. Everyday from noon until 7pm our daytime menu offers starters and light bites, over 20 main courses, and our popular ‘Traditional Favourites’ section. In addition to this our Specials Board always offers something a little different, and on Sundays there is also a choice of traditional Sunday roast. We also offer charity theme nights throughout the year, usually on Sunday evenings with tribute bands and local talent which have proved very popular. The staff are very friendly and help to make the experience memorable. We have an extensive wine list and offer wine promotions on the house wine most days of the week. Bistro 42 is a restaurant and bar with modern interior and a cosmpolitan menu. 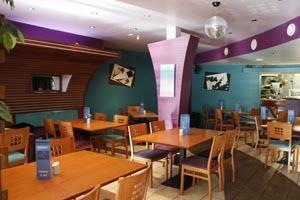 All in all Bistro 42 is a lively, warm and friendly eating and meeting place. Based in the centre of Horbury on the High Street. 100yards from the Co-op and opposite the Fleece Public House.